Dr Huw Lewis-Jones is a historian of exploration and art director with a PhD from the University of Cambridge. 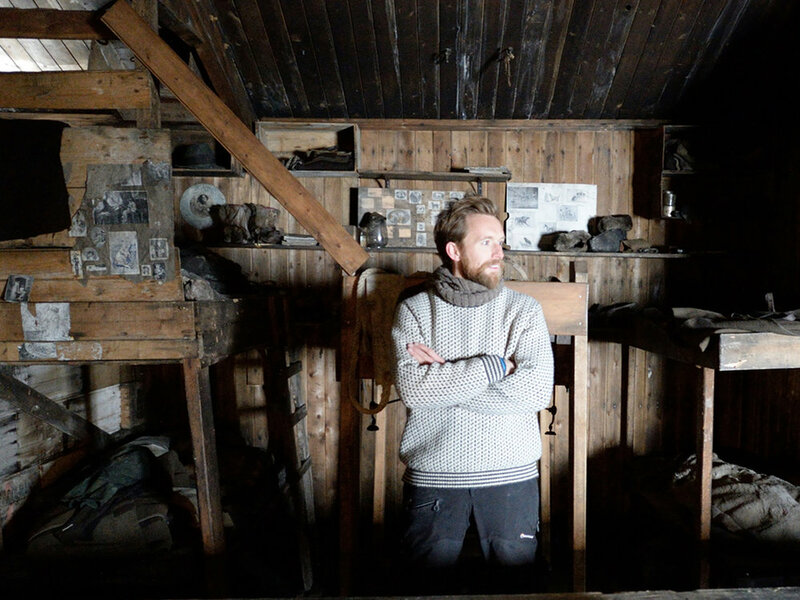 Formerly Curator at the National Maritime Museum and the Scott Polar Research Institute, Huw is now an award-winning author who writes and lectures widely on exploration, history and visual art. He’s also an experienced polar guide, who has worked on both sides of Antarctica and voyaged many times to the North Pole. Huw found some time before he sets off on his latest Arctic adventure to speak to me about his passion for the polar regions, his interest in the visual aspects of exploration, some of his books and inspirational adventurers. Who inspired your love of exploration and specifically polar exploration? My grandfather flew helicopters in the Royal Navy; he went all over the world but particularly in Antarctica throughout the 1950s, landing on remote islands, ferrying marines around and helping ships stuck in the ice. He was full of stories and inspired me to start reading and writing about the polar regions, introducing me to explorers like Shackleton and Captain Scott. In time I became a historian and later curator of the Scott Polar Research Institute, which involved creating exhibitions for the University and overseas. The museum was full to the brim of amazing artefacts, histories, stories and objects from the heroic age of exploration. Special things like Captain Scott’s last letters, personal equipment, photographs from expeditions by the likes of Herbert Ponting and Frank Hurley. We also had paintings and expedition gear from Wally Herbert, a more recent explorer, including his polar bear skin trousers. I later met his daughter Kari – she knocked on my office door at the museum one day – and many years later we’re now married. So, I’m surrounded by expedition stories and artefacts. It is no surprise that I ended up writing about Antarctica and the Arctic and wanting to go and see the regions for myself. Is there a book on your bookshelf that was particularly inspirational for you as a child? I enjoyed those wonderful Ladybird books when I was a child, on Captain Scott, Admiral Nelson, Captain Cook, the traditional kind of British heroes. I was given a book about the first crossing of Antarctica by Vivian Fuchs and Edmund Hilary, the hero of Everest, when I was about ten and remember devouring it. I loved that book and still have it here on my shelf; fast forward twenty years, and I had the chance to create another about that expedition using materials from private archives, rare photographs, and journals. The book focused on one of the surviving members of that expedition, a photographer from New Zealand called George Lowe who was best friends with Hillary. What is it about the polar regions you find so special? I love to be in the Arctic and anyone who has travelled there too will understand why. Yes, it’s challenging, and often inhospitable, but it’s also a place that makes your heart sing.. The scale, the beauty, the emptiness, and the wildlife make the polar regions some of the most rewarding regions on the planet. Being able to travel to Antarctica and show people where many heroic expeditions played out, as a guide and historian, is a real privilege. Not many people get to go to the Ross Sea side on Antarctica, it is as far south as you can go by ship. I’m also lucky to work on a Russian nuclear icebreaker that makes voyages to the North Pole each year. Being able to get there relatively easily, chugging north in a ship, driving little zodiac boats, flying in helicopters, and telling historical stories is a privilege. Going on trips to the polar regions are a chance to leave my desk and the archives behind and feel close to wilderness. If you are in a creative industry, whether that is as a writer, musician, or artist, and you’re lucky enough to be able to head out, there’s plenty of inspiration to be found in the wilderness. That is part of the attraction of Antarctica, for sure. What explains your interest in the visual aspects of exploration? I’m particularly curious about the way that environments are depicted and understood. My PhD research was all about how the Arctic is imagined as a place, how stories were told, and how the Arctic was reconfigured in visual culture, through paintings and the press, spectacles and shows, in the spoken and the written word. Imagining the Arctic, my latest book, is basically much of this work; it is about how in the nineteenth century the notion of wilderness evolved and how people in England frequently ‘got lost’ in the frozen north through the stories of famous explorers. There are adventurous types today who have been inspired to recreate the feats of explorers from the past through the stories they have been told and the images they have seen. For some people, the Arctic is this remote place that needs to be fought and overcome but for millions of people its a place they live in and have done so for generations; when there is a conversation on how we should respond to the impact of a changing climate on the region, we need their participation. What is it about maps you love so much? Maps are full of stories, stories of who made them and what they are depicting and that is why I love them. They remind us of great trips we have been on, memories of a place, or books we have read, all these layers exist within a single map. I particularly like the old cartography, medieval maps with monsters on the pages because there is infinite room for storytelling in maps like that. As much as maps send us out on journeys, they also encourage us to make journeys for ourselves in our minds, they fire our imaginations with possibilities. You open one up, point to a place and think about how you can make it possible to go there. Why did great explorers from history put such emphasis on their journals and sketchbooks? Think back to a time before photography and film when true explorers went to places that had never been seen before. Part of the job of an explorer then was to make a record of their journey, whether it be a map or setting down details of their discoveries in journals and sketchbooks. For many of the explorers, these would be the objects that outlive them, if they did not make it back, maybe their journals would. Captain Scott is an obvious example, he wrote his last words in a small sledging sketchbook, borrowed from his friend, the artist Edward Wilson, right up to the point when a blizzard was about to engulf his tent. You can open the sketchbook of an explorer and jump into a moment of a great discovery or a great journey. They provide an insight into the exploring life and what compels explorers to want to reach places where others would not dare to go. What is it about maritime exploration that inspires you? I love the sea; it’s that simple. Whether being in it, or working on it. I grew up in Guernsey, and was the curator of maritime history at the National Maritime Museum in London for a time. I live by the sea now and get a lot of pleasure and inspiration from it. A while back I wrote a book called Ocean Portraits, with leading maritime photographers like Rick Tomlinson, a famous yachting photographer, and David Doubilet, a veteran underwater photographer. Ocean Portraits was a chance to write about people I admire and to pair up these features with materials from the archive that rarely get looked at. The book tells the story of marine photography and portraits of people who have influenced how we think about the sea as well as made great voyages across it. I like your happy historian twitter hashtag, what is the story behind that? The reality of being a writer and a historian is that you spend a lot of time at your desk, in archives, or in the library, it is not particularly glamorous. But every now and then, I get to go to incredible places or work in collections I never dreamt of being able to access. The #happyhistorian derives from that; I first used the hashtag on a trip to New Zealand, I was bungy jumping after speaking at a book festival there and it seemed strange at the time because my historical research had led me out into the world, standing on the edge of a bridge, or later driving a little boat through a maze of ice. I’m now able to pursue some of the things that really interest me and it’s good to remember how fortunate I am. When I’m in Scott’s hut, telling stories about a place, happy seems like the most appropriate word to me. What do you perceive to be the most heroic expedition of all time? Many people might say Shackleton’s expedition, and for good reason. But the more you read the more you realise how little you know. There are so many other remarkable expeditions I’m learning about all the time, intrepid lady Victorian travellers, botanists and plant collectors, Inuit journeys and other indigenous guides; expeditions that most people do not know anything about because there wasn’t a bestselling book on the adventure or they didn’t have a talented photographer along for the ride to capture pictures that keep their story alive. I’m drawn to the stories of experienced folks who went about their difficult exploring in a modest way, managing through skill and judgement to avoid major mishap. Men like George Lowe on Everest. I have to say, Wally Hebert’s first crossing of the Arctic Ocean is an epic; it is the longest polar journey, a true exploration, a journey of implausible difficulty that everyone said at the time could not be done and no one has repeated since.